Kyle Grillot - kgrillot@shawmedia.com Dancepiration started several classes for special needs children after Physical Trainer Beth Saip proposed the idea. Becca Ferio of Cary walks with Taylor Way, 5, of Algonquin. Now in their second year of the classes, dancepiration is looking to branch out and offer more classes for younger children. Kyle Grillot - kgrillot@shawmedia.com The Dancepiration class works on their routine Saturday during the class for special needs children ages 4-6. Dancepiration started several classes for special needs children after Physical Trainer Beth Saip proposed the idea. Now in their second year of the classes, dancepiration is looking to branch out and offer more classes for younger children. Kyle Grillot - kgrillot@shawmedia.com The class plays around after their practice in the Dancepiration studio on Saturday. Dancepiration started several classes for special needs children after Physical Trainer Beth Saip proposed the idea. Now in their second year of the classes, dancepiration is looking to branch out and offer more classes for younger children. 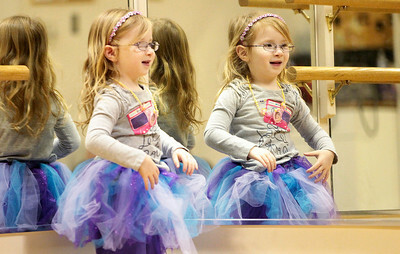 Kyle Grillot - kgrillot@shawmedia.com Lea Lasco, 4, of Fox River Grove works on her routine at the Dancepiration studio on Saturday. Dancepiration started several classes for special needs children after Physical Trainer Beth Saip proposed the idea. 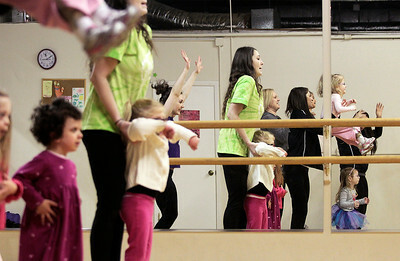 Now in their second year of the classes, dancepiration is looking to branch out and offer more classes for younger children. Kyle Grillot - kgrillot@shawmedia.com Lea Lasco, 4, of Fox River Grove works on her routine with lead instructor Chrissy Rossi at the Dancepiration studio on Saturday. Dancepiration started several classes for special needs children after Physical Trainer Beth Saip proposed the idea. Now in their second year of the classes, dancepiration is looking to branch out and offer more classes for younger children. Kyle Grillot - kgrillot@shawmedia.com Ellie Banzen of Inverness works on her routine at the Dancepiration studio on Saturday. Dancepiration started several classes for special needs children after Physical Trainer Beth Saip proposed the idea. Now in their second year of the classes, dancepiration is looking to branch out and offer more classes for younger children. Kyle Grillot - kgrillot@shawmedia.com Lily Jorgenssen, 7, plays around with instructor Deanna Grelecki of Oakwood Hills after their practice in the Dancepiration studio on Saturday. Dancepiration started several classes for special needs children after Physical Trainer Beth Saip proposed the idea. Now in their second year of the classes, dancepiration is looking to branch out and offer more classes for younger children. Kyle Grillot - kgrillot@shawmedia.com Lea Lasco, 4, of Fox River Grove works on her routine with instructor Julia Smith of Huntley at the Dancepiration studio on Saturday. Dancepiration started several classes for special needs children after Physical Trainer Beth Saip proposed the idea. Now in their second year of the classes, dancepiration is looking to branch out and offer more classes for younger children. 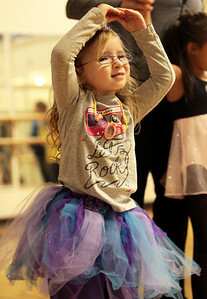 Lea Lasco, 4, of Fox River Grove works on her routine at the Dancepiration studio on Saturday. 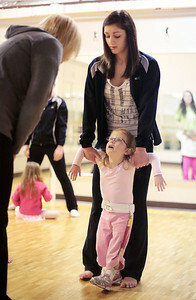 Dancepiration started several classes for special needs children after Physical Trainer Beth Saip proposed the idea. 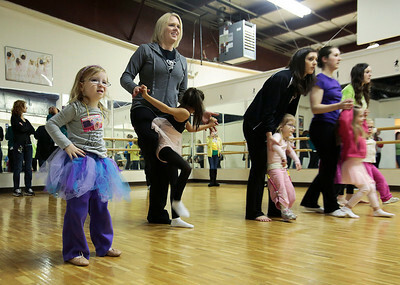 Now in their second year of the classes, dancepiration is looking to branch out and offer more classes for younger children.